Veggies in space gives your children a fun and frolicsome lesson in the power sharing as they boldly go where no Veggies have gone before. Join the adventure as Captain Cuke (Larry the Cucumber) and first officer, Mr. Spork (Bob the Tomato) blast off for an out-of-this-world adventure into the real meaning of fair shares for all. Now the Veggietales crew take to the stars in a high quality animated DVD that pushes on to The Fennel Frontier as they dodge popcorn asteroids and learn a powerful lesson about sharing: if you have enough to spare, then you have enough to share… and it rhymes! Your 3s to 8s – and older children too, will love the bright energetic animation, the clever engaging characters, easy to follow adventure story and the appalling puns that make children laugh, giggle and remember the lesson: sharing is the way forward for everyone. Grown-ups will love the way Veggies in Space delivers a simple, easy to live out message about team working. The animation is first class, the humour clever and wholesome, and even the music is top rate stuff with input from Grammy nominated Jamie Grace. Engage your kids, energise their imagination and beam them up into this exciting and pun filled space adventure toward the fennel frontier of selfless sharing and working together. Region 0 DVD will play on UK DVD players. In English and Spanish, with English and Spanish subtitles. 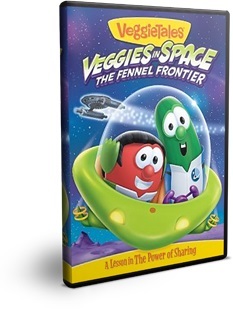 Veggies in Space - The Fennel Frontier DVD by VeggieTales was published by Authentic in March 2014 and is our 5846th best seller. The ISBN for Veggies in Space - The Fennel Frontier DVD is 5060256821397. Watched this with a small group of young people aged 4-14 yrs. It was funny, as befits a Veggietales movie, with excellent Bible application. It works on several levels, but for older children and adults it's fun to spot the references to many sci-fi classics. I'd certainly recommend this dvd. Take a peek at some articles related to Veggies in Space - The Fennel Frontier DVD. Got a question? No problem! Just click here to ask us about Veggies in Space - The Fennel Frontier DVD. The very latest space adventure from the ever popular VeggieTales team. A lesson in the power of sharing. Boldly going where no Veggies have gone before, Captain Cuke (Larry the Cucumber) and first officer, Mr Spork (Bob the Tomato) blast off for an out-of-this-world adventure. about sharing: if you have enough to spare, you have enough to share. Featuring music by Grammy-nominated and Christian Billboard top 10 artist, Jamie Grace and includes a Brand New Silly Song with Larry, 'Asteroid Cowboys'.